Just took a sweet photo of my daughter's new French style full bed. She imagined it as a daybed. We are in the midst of making the room her dream for a teen. The linens are different textured whites, so the bed is easy to make or not make. omg how gorgeous is that bed??? Very pretty. Love the butterfly. What a pretty bed, and I love the pillow tossed on the floor with what looks like a 50s or 60s pattern. I have to apologize, here I've been visiting and enjoying your pretty posts and too shy to say hello, and then just found that you visited and commented. Thank you for giving me a reason to say hello here. Oh my seriously, adorable! Not nice to tease us like that! Her bedroom is so dreamy...heavenly. Your daughter is lucky to have such a beautiful bed! I wish I had one like that. 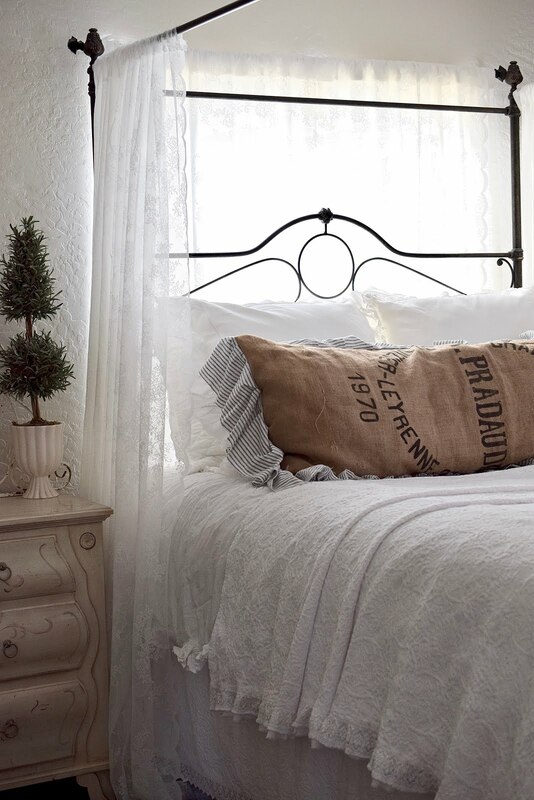 Bed, linens, garland all so beautifully feminine! Everything is absolutely gorgeous! Happy weekend to you! What a magical room, and a butterfly to boot. This room is dreamy, and I wouldn't mind taking a rest in her bed as well. I can see why you like to read and nap there. She has a great designing mama, giving her a place to rest her heart on. A garland with lowers and a butterfly! This is perfect fo a good night sleep and lovely dreams. Wow I'd never want to let go of that bed! Love the garland too- perfect and sweet! What a beautiful, cozy bed! I love her addition of the garland. Enchanting. I so very much want to adopt that girl as my granddaughter. Do you think she'd have me, Su???? Looks so lovely and inviting! What a pleasure it must be to retreat there with a good book on a quite sunny day! I know about 30 women who would swoon over the butterfly! We are in a women writers group called CHRYSALIS: EMERGING WOMEN WRITERS. A butterfly is our representation! Wow Su I really love your daughters bed! It is so unique with the butterfly and I love those pillows! Yes it does look very French! I would love that fir my own room! I love your decorating style. Have a lovely weekend. Absolutely lovely! We'll all want a bed just like it. Fit for a princess! Gosh I love that bed! Wow, that bed and her style just invites sweet dreams. Love the bed! Cutie patuie! My dream bedroom! I adore the butterfly and the garland! Beautiful bed. It must almost guarantee sweet dreams. Lovely! I found your blog through Mod Mix Monday and I've truly enjoyed perusing your past posts. 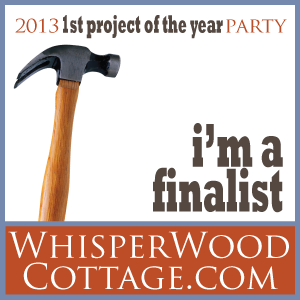 I'm in the process of installing beadboard in our kitchen and it appears you've got the same in yours. I'm in love with your kitchen! 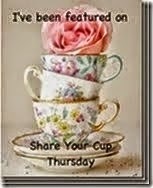 You've done a wonderful job decorating your home and I look forward to seeing more! Oh my goodness, that is absolutely dreamy! And I love the butterfly. Thank you for visiting. We have had that butterfly for awhile. Have a wonderful weekend. 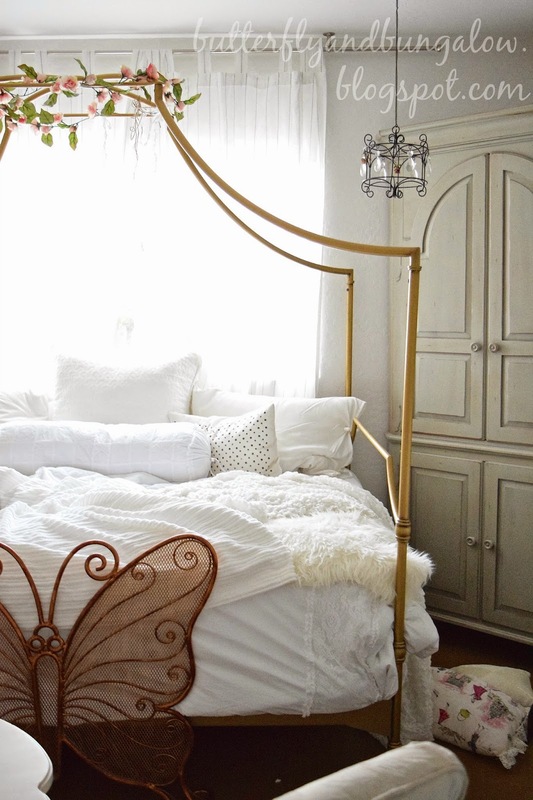 Her bedroom is absolutely adorable... and with a butterfly! Your daughter's bed is just darling! Love the pretty garland she added. That is the most beautiful bed I have ever seen! Just beautiful, such a lucky girl to have such a lovely room! The butterfly is just perfect,too. That's so beautiful, I love the big butterfly. Thank you, B.J. I'm so sorry for your loss. Hugs. Thank you, E, for your sweet visit and compliment. Hugs. Thank you, Donna, for your sweet visit. I love the baskets you painted and embellished. Hugs. Gorgeous. Hopped over from Jann's blog. What a gorgeous room. Thank you, Katie, for stopping by and for the sweet comments. So pretty, from top to bottom, beautiful! Thank you, Cindy. Have a wonderful weekend. I loved that bed when you shared it on another post. Perfect for your cute teen!! Thanks for sharing with SYC. Hi Su, just hopping back to let you know that I am featuring you at SYC this week. Thank you, Jann. Wow. Thank you. That's so sweet! Oh my gosh Su - that bed is just fabulous - your daughter has such incredible taste for her age - love love love ! Off to pin now !